Embattled Nokia has been doing it tough in recent years, but the Finnish giant hopes the Lumia 800 will be the device that turns its fortunes around. It's the first Nokia smartphone to run the Windows Phone operating system, and we also think it's the first smartphone that effectively competes with iPhone and Android rivals. The Nokia Lumia 800 may not be a better phone than some of its competitors, but it's certainly a viable option for any potential smartphone buyer. Note: The Nokia Lumia 800 reviewed here is an overseas model available to purchase through Australian online store MobiCity. Nokia will officially launch the Lumia 800 in March, and we'll update this review with any necessary local additions when it hits the market. Take the Nokia N9, swap MeeGo for Windows Phone 7.5 and you get the Lumia 800. 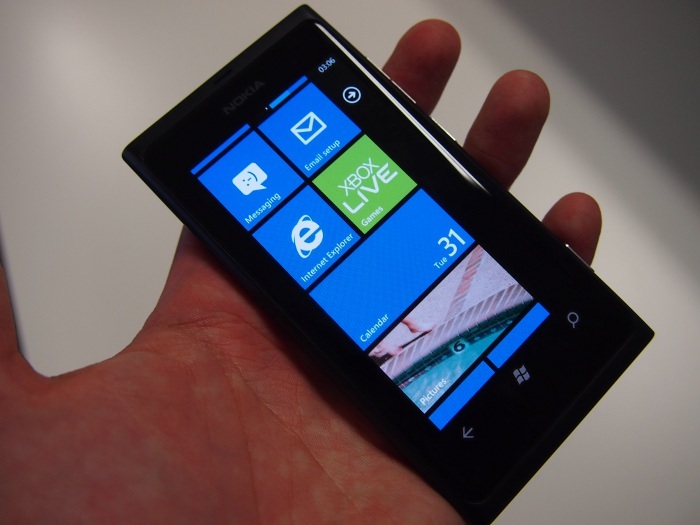 Nokia will tell you it's not exactly that simple, but the Lumia 800 looks almost identical to the N9. Normally we would be firmly against such blatant replicating, but the N9 was one of the best looking smartphones we've ever reviewed, so the Lumia 800 at least gets off to a positive start. From the moment you pick it up the Lumia 800 feels like a superbly constructed piece of hardware. It's light to hold, but not light enough that it feels flimsy or cheap. The edges of the phone are rounded, so it sits in your hand perfectly. After using it for only a short period of time, the whole user experience — from holding the phone in your hand, to interacting with it by touching the screen — simply feels natural. If you're concerned about the trend of smartphones getting larger, we feel Nokia has struck a near perfect balance between a large screen and a comfortable design. Like the N9, the Lumia 800 uses a solid polymer body that Nokia says is manufactured from the same material often found in ice hockey helmets. The Lumia 800's polycarbonate casing is coloured all the way through in the manufacturing process so scratches, dents or marks from everyday use will not show up. The Nokia Lumia 800 will be available in black, white, cyan (blue) and magenta (pink) colours and these will vary depending on carrier. There are a couple of minor differences in design between the N9 and the Lumia 800. There's no front facing camera on the latter and the screen is slightly smaller — 3.7in compared to 3.9in. This isn't a huge deal breaker as the extra space was necessary to include the touch-sensitive Windows keys below the screen — back, home and search. The Lumia 800 also has a dedicated camera button on the right hand side which the N9 didn't include: it's a very nice inclusion and makes using the camera quicker and easier. 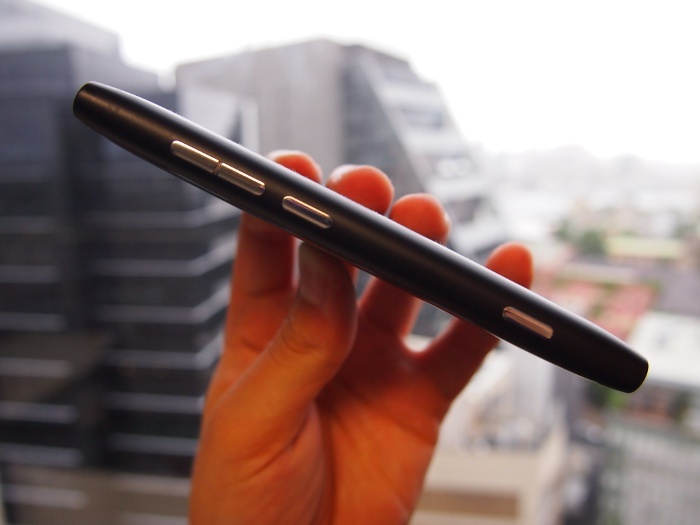 Perhaps the only negative about the Lumia 800's design is the flap that covers the micro-USB port on top. It's awkward to open as you need to dig your fingertip into the left side of the cover to flip it up. The Nokia Lumia 800's screen is responsive, bright and clear. It also displays outstandingly rich blacks, has superb viewing angles and performs reasonably well in direct sunlight. However, it lacks the higher, HD resolution of new phones like the Samsung Galaxy Nexus. This means the 480x800 panel doesn't render text as well as some of its competitors. This is most evident when it comes to browsing the Web: text often appears jagged unless you zoom in quite close.